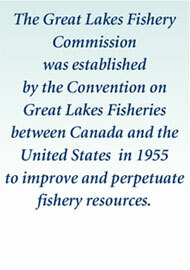 Following a nearly four-year team effort at analysis and writing, the Commission announces publication of Ciscoes (Coregonus, subgenus Leucichthys) of the Great Lakes and Lake Nipigon. This report, styled as a monograph, is available online now and will soon be printed for field use. Ciscoes historically were the dominant consumers of zooplankton throughout the Great Lakes. Comprising eight main forms, this complex provided critical links in food webs between invertebrates and top predators like Lake Trout and Walleye. Ciscoes also supported wide-ranging commercial fisheries. One form of cisco inhabited upper waters and was predominant. The other seven forms all inhabited deep water and were marketed as chubs. The new monograph represents an update of a study by Walter Koelz, published in 1929. He was the first to systematically describe the forms and document their life history. His field studies, conducted aboard commercial fishing boats, lasted from 1917 to 1924, and encompassed 14,000 specimens—a colossal undertaking. Many of his specimens are archived at the University of Michigan Museum of Zoology, where he once worked. The diversity of ciscoes documented by Koelz did not persist long after the completion of his studies. In fact, the two largest forms in Lake Michigan were approaching extirpation even while he collected. The cause was intensive fishing with gillnets that selectively removed the largest forms, allowing the smaller forms to proliferate. This situation worsened when the sea lamprey invaded the Great Lakes and preferentially preyed on the largest forms, compounding the problem [Lamprey Nativeness Claims Annulled by Commission's Eshenroder]. The sea lamprey also decimated the Lake Trout, which had been counteracting somewhat the effect of the chub fishery by feeding on the smallest forms, in particular the smallest, the Bloater. The Bloater turned out to be a pest species as regards its relationship to its larger-bodied sister forms. Freed from predation by Lake Trout, the Bloater proliferated and displaced or hybridized with the remaining forms of deepwater ciscoes in Lakes Michigan, Huron, and Ontario. Now, only Lakes Superior and Nipigon contain their original complement of ciscoes (four each), Michigan and Huron have but two (each had eight), Erie has none (had two), and Ontario has one (had four). Owing to these profound changes in diversity, suspected changes in body morphology within surviving populations, and known instances of hybridization, Koelz’s work was long overdue for an update. The new monograph responds to this need. Its focus, like that of Koelz’s work, is on morphology and identification. Both pen and ink and color illustrations accompany updated descriptions of each form in each lake. The morphology of extant forms is compared to Koelz’s descriptions of the same forms in each lake, allowing for detection of morphological changes that occurred over almost a 100-year period. Sketches of the ecology of each form in each lake provide for a quick study of important literature. The research associated with producing the new monograph resulted in several surprises of which three follow. First, the sole remaining deepwater form in Lake Huron turned out not to be the Bloater as had been presumed for over 50 years, but appears instead to be the result of hybridization and introgression among five forms of deepwater ciscoes whose last reported occurrence was 1956. Such assemblages are known as hybrid swarms. Two, the form that once supported the largest freshwater fishery in the world, that of Lake Erie, has gone missing. 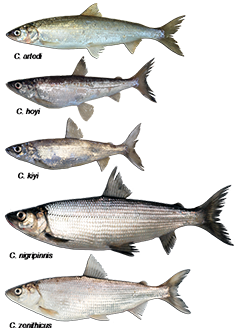 Three, the form of cisco that dominated the fisheries of Lakes Michigan and Huron appears to be extirpated from those lakes and is now abundant only in Lake Superior. The new cisco monograph is published just as field biologists in four of the Great Lakes (all but Superior) are gearing up to assess the remaining cisco populations (ciscoes have been a priority in Superior for decades). This effort owes to an emerging interest in reintroduction and to an understanding that, in Lakes Michigan and Huron, fishes that feed on zooplankton and provide prey for trout and salmon in offshore pelagic waters are vanishing. This convergence of science and enthusiasm is fortuitous and presents an opportunity to build upon the recent, long-awaited successes in rehabilitating Lake Trout populations. 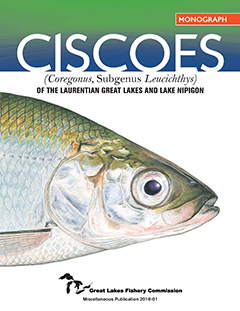 Ciscoes (Coregonus, subgenus Leucichthys) of the Great Lakes and Lake Nipigon is available at http://www.glfc.org/pubs/misc/Ciscoes_of_the_Laurentian_Great_Lakes_and_Lake_Nipigon.pdf.